As mentioned in the caption for the work 'Bushfire between Mount Elephant and Timboon, March 1857', 1859, the Western District of Victoria property 'Larra' was owned by John Lang Currie in partnership with Thomas Anderson. The property had earlier belonged to James Kinross, and with Currie's good management became one of the outstanding wool-producing properties in the area. In 1850, Currie bought out Anderson's share in the property. 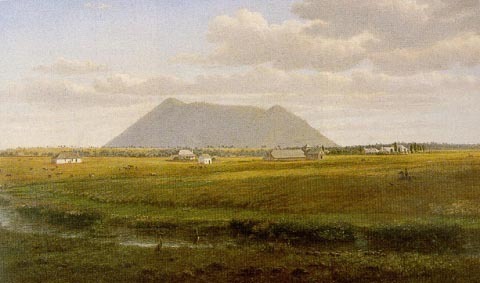 In March 1857, Eugene von Guerard visited Camperdown, and toured this region of the Western District. He witnessed the large bushfire of March 1857 and his work depicting this event, painted in 1859, was purchased by John Lang Currie. This work was commissioned by John Lang Currie, and was offered for sale through Sotheby's. Fine Australian Paintings. November 1992, Catalogue no. 237.